I’ve had to have some difficult discussions with my cats lately, mostly about how they never help out around the house, and how I feel like they take me for granted. So while I’m up north trapping bald eagles this weekend, I have asked them to start looking for jobs. Doesn’t have to be anything full time, but just enough to start bringing in a little pin money for catnip and the fancy clumping litter they can’t seem to live without. I didn’t think they were actually serious about it, until I walked into the bedroom and found them trying on interview suits. I actually cried a little when I saw them all dressed up – I was so proud. And I really like that Podo isn’t boxed into gender stereotypes about how women shouldn’t wear ties to work. I think she looks classy, kind of like a young Katharine Hepburn. Kodo preferred the slightly askew, devil may care look. So when I get back, not only will I have skinned my first bear, but I may also come back to a three-income household (fingers crossed). Wish us all well! let me get this straight… you can’t get them to wear collars, but they’ll gladly prance around in their fancy interview ties? sheesh, cats. They look like tiny little accountants. A potential employer would never guess that they sleep 20 hours a day. I think she looks a little Annie Hall and Kodo looks like Jim from the office, handsome in a slightly disheveled way. Did they tell you want kind of work they are going to look for? You’ll be lucky if they haven’t staged some sort of ambush. Cats are essentially non-working. Mine are part of the Union, and every time I try to get them to do something, ANYTHING, they file a grievance and threaten to strike, and since they are more evil than teamsters, I generally cave. 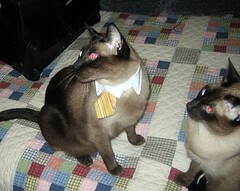 i really want to get some ties like that for my cats. where did you get them? haha! You single people are weird. Have a fun weekend! Meet a Sasquatch! You do understand that your cats might just kill you in your sleep for dressing them like that, don’t you? They seem to be wearing collars but my cats always get better jobs when they wear skirts too. And you won the somewhat valuable prize in my sweet little lies contest. Email me with your addy and I will send you something. That is the funniest thing I’ve seen in some time. 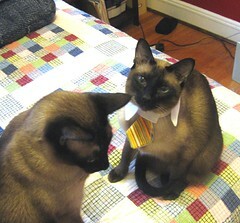 Cats in ties. I may have hurt myself laughing. kat: well, they’re quite the dandies, so they like getting dolled up. cheryl: true, but their productivity during those 4 waking hours is off the charts! arwen: they didn’t get into to many specifics, but i see kodo succeeding in sales, and podo might be more the graphic design type. tracy lynn: i just hope they find a job with good benefits because this family healthcare plan is seriously expensive. sizzle: aren’t they the best? my favorite store for all my pet costume needs: target! shari: hmm… you may have a point. when i came home today, they gave me their share of rent all in crumpled up dollar bills! don: or rather, are we weird people single? sam: well, podo always says that skirts make her look too hippy, so she sticks with pant-suits. without the pants. suebob: i did? this must be my lucky day! mad william: then this was $5 well-spent. When does the Bunny Head get a tie? vivian: bunny head + tie = too hugh hefner. bunny head is more cerebral than that. We gave our cat the same speech. Hope your results aren’t as disappointing as ours were!